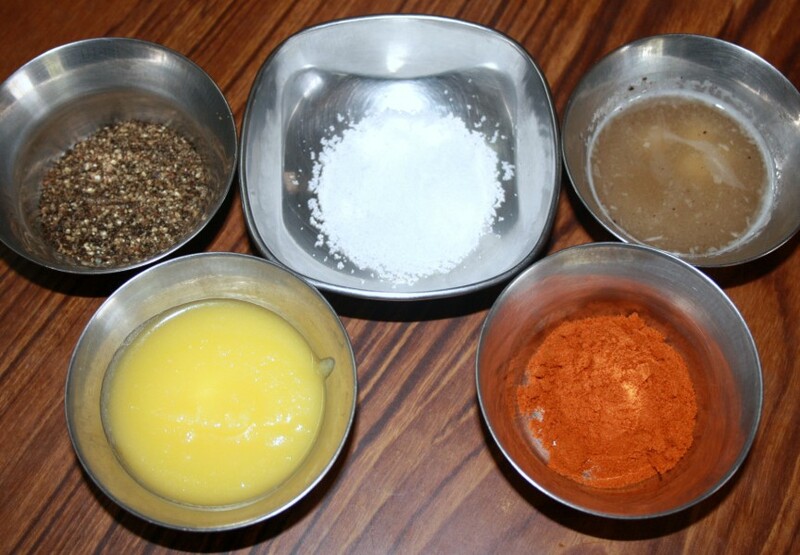 Kara Sev – Indian Cooking Challenge for June ~ Step By Step Recipe! For Indian Cooking Challenge this month it was yet another savory called the Kara Sev. One can’t resist the temptation this yields to one. We never used to buy savories from shop but this was one such traditional Indian Savory that we end up buying from Shop. I have seen Amma making this couple of times. And I am sharing two of her versions that she shared. Its been a while since she made these but remembers that it came out really well. For the lack of the ladle that is used for making this, prevented her from making this again. But Lataji who tried this recipe said she didn’t really find the need to have that special ladle to press this down. Using the murukku achchu she was able to get the effect. We also didn’t have the Kara Sev ladle, so made it with the regular press that had a wider hole. The result was very tasty one but I felt it wasn’t as soft as what we get at shops. The difference between Murukus and Kara Sev is that the latter is not as crispy as the former. In a bowl, sieve the flours together. Get the masala all ready in place. 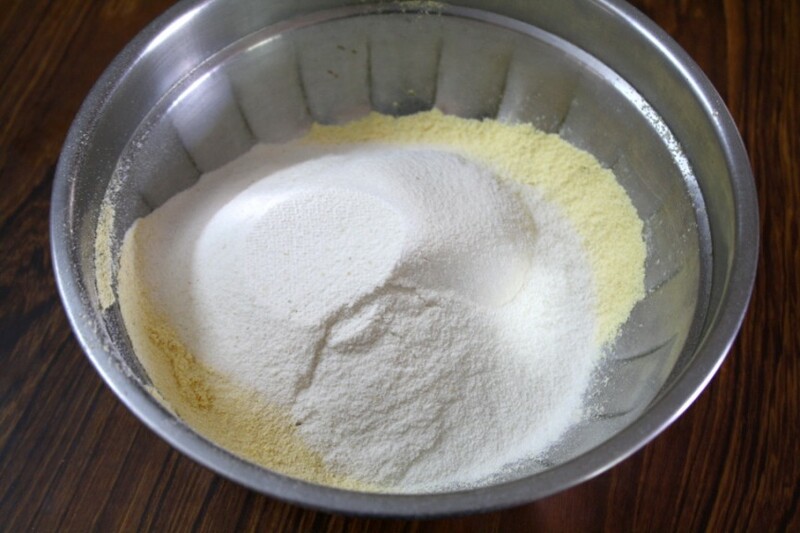 Add one by one to the bowl with flour. You should get a crumble like this. Finally gather together like this. After this it is same as regular muruku. I will post on detail with the actual sev ladle and post pictures on that. 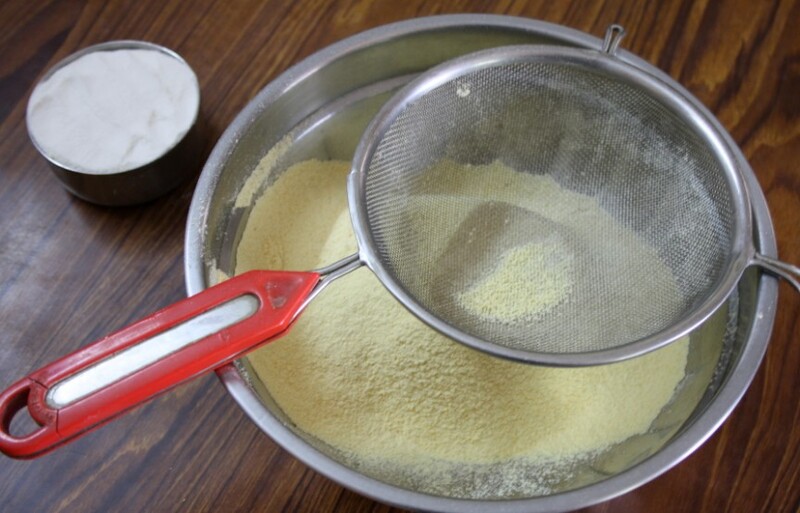 Sieve both Gram flour and Rice flour together in a bowl and make a pit. 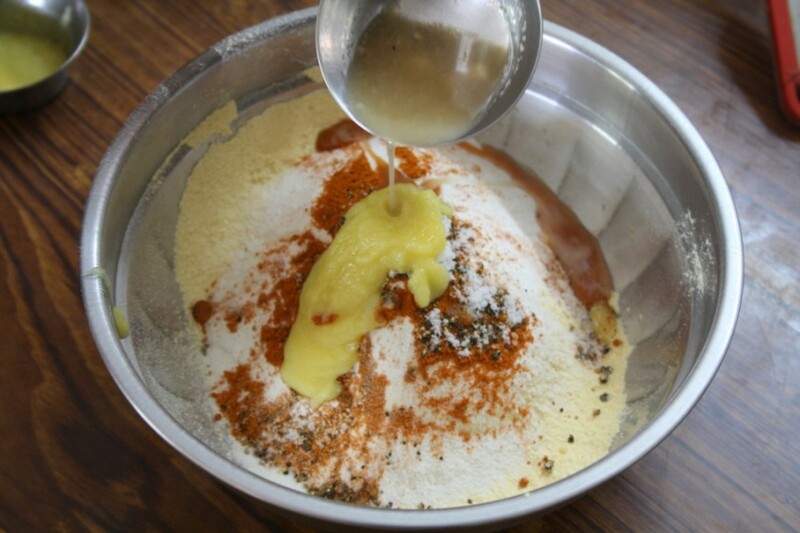 Add chilli powder, Pepper powder, Salt, Crushed garlic, Ghee, Cooking soda. Mix thoroughly with hands. It should look like bread crumbs. 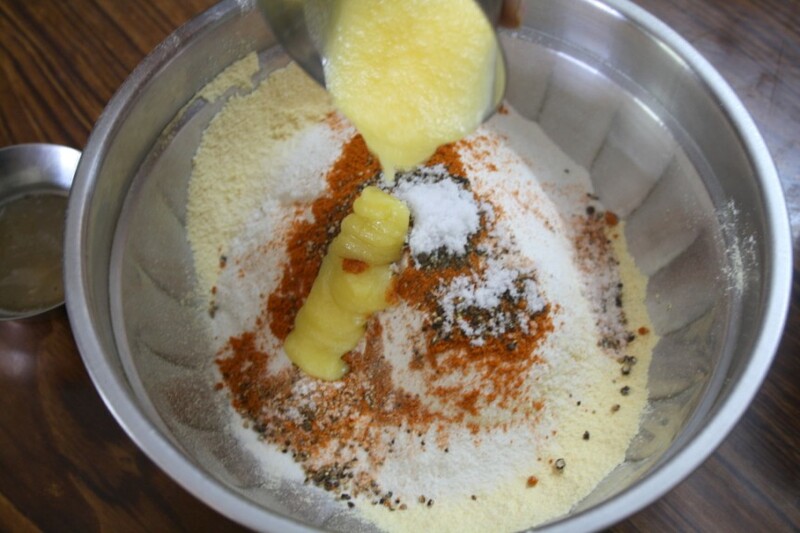 Divide the dough into 4 portions. 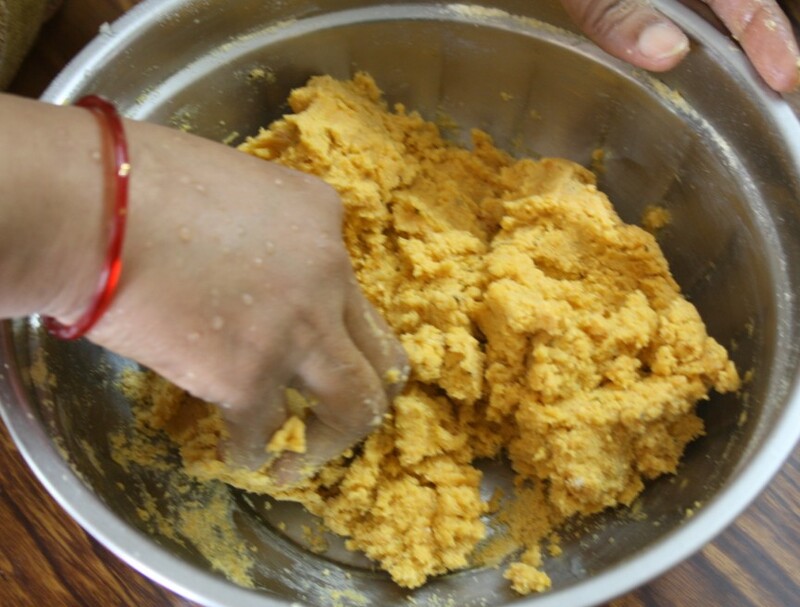 Take One portion of this mixture, sprinkle water, knead like Puri dough. 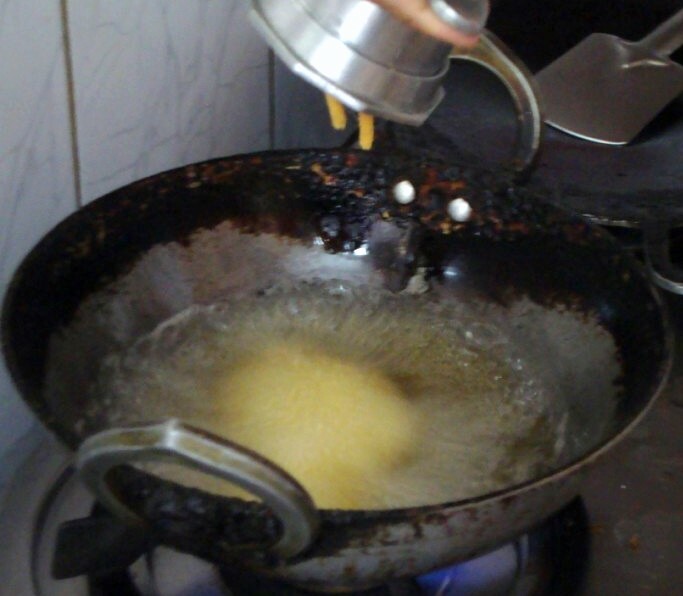 Heat oil in a kadai, Use a ladle with lot of holes (Kara Sevai ladle) or Sev maker. Put some dough on that and rub directly into oil. It will be like split string. Deep fry in oil , drain excess oil. After cooling this off, Store this in an airtight container. In a big plate cream ghee & soda very well till the paste looks white. 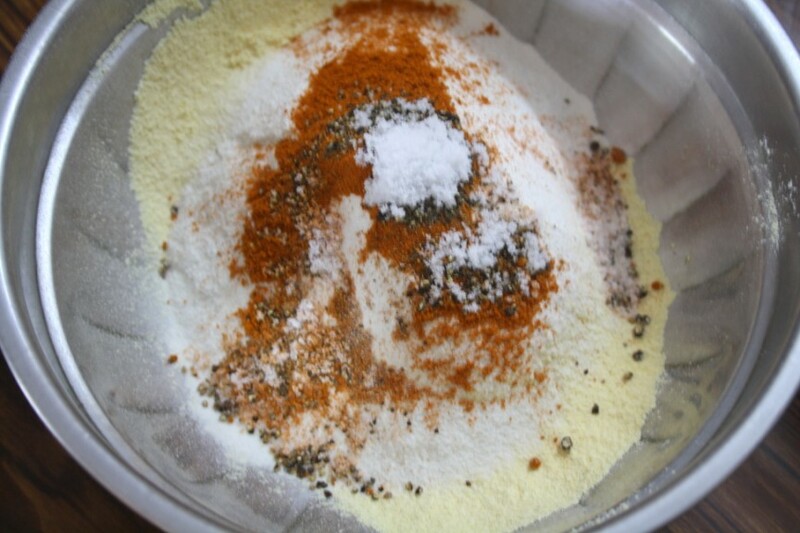 To this add flours & salt. Strain the chilli paste & add, mixing everything well. 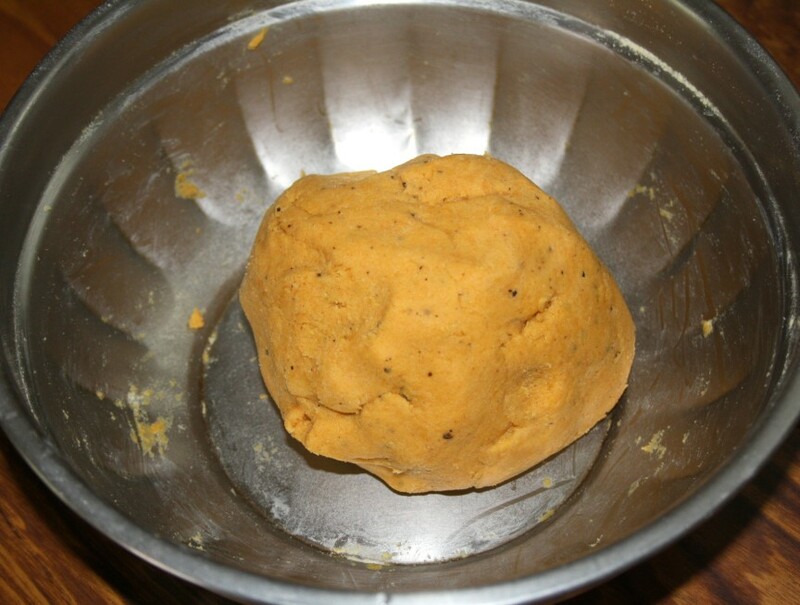 Add enough water to get a soft yet stiff dough. Heat oil & keep the ‘karasev jalli karandi” ( a special holed ladle used for this) above the oil. Rub the dough on it so that long strands will fall into the oil. 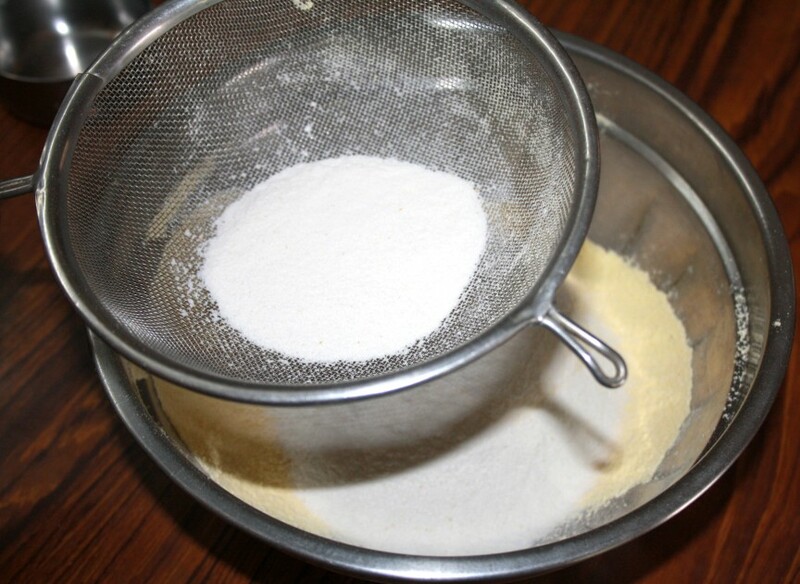 Fry well & remove to a kitchen tissue. Wash the “ jalli karandi” ( ladle) with water every time after use, so that the rubbing will be easy. 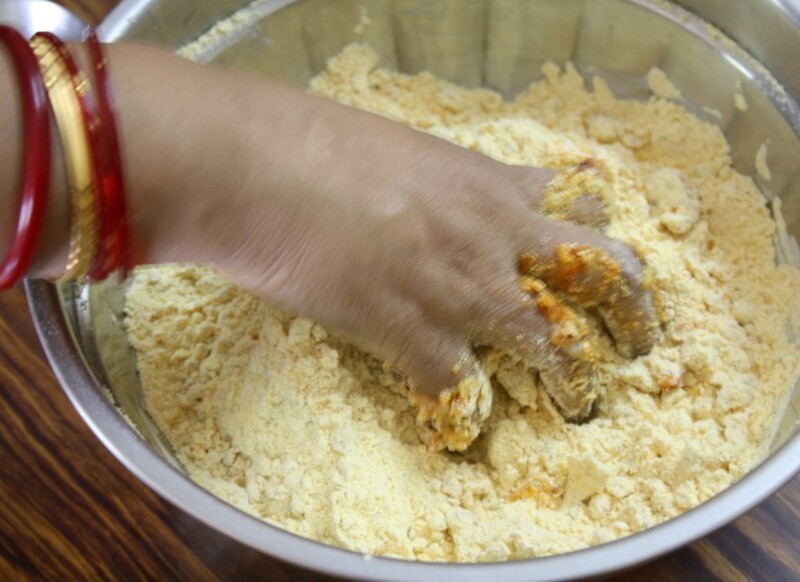 By dividing the dough into smaller portions before pressing down, will keep the dough fresh and also it consumes less oil while frying. The dough has to be really stiff, if it little runny, add more desan to get the right consistency. If you are using the kara sev ladle, rub it down directly on the oil. If you are not comfortable pressing directly in the oil, you may press on a slightly oiled sheet or plate and transfer the bits into the oil. 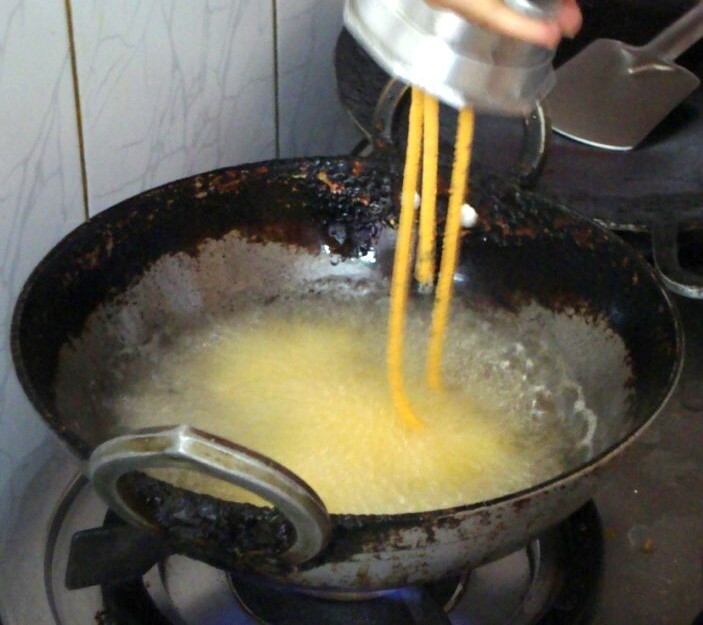 If you do not own a murukku press, try to roll thin cylindrical shapes using fingers, just about 2″ long and deep fry. Please ensure you are very careful while pressing down on the oil, it will be very hot, this is really not safe to have kids around. This normally stays crispy for a month when stored in an air tight container. To all my ICC members, please link your Kara Sev post to Mr. Linky. Crispy Sevs perfect for tea time…..
Must admit was reluctant to try it….but it came so so good! I do not think I have any left so I must make more. Thanks, Srivalli! Dear Srivalli, my name appears twice since I have first linked Vegetarian Yogini to your own site! Please remove my name in the list, which is no 4. Sorry. Had fun with this challenge, looking forward to the next one! 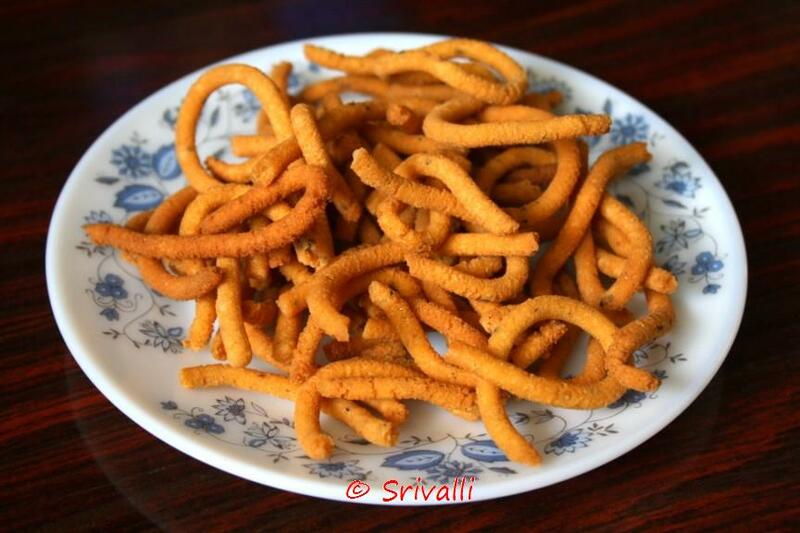 The step by step pictures are so helpful srivalli, Sev looks yumm yumm..
the kara sev was extremely delicious. Thanks for the recipe.Nice snack it turned out very delicious.I just posted the recipe. Sev looks so tasty. I missed this time challenge. Looking forward for the next one. 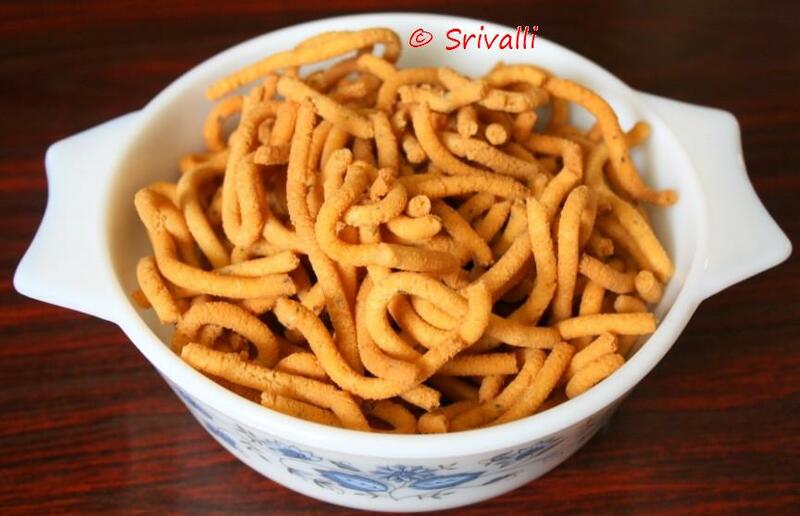 Srivalli, we tried with the chakli mould and prepared fine sev adding more chili powder. They came out good. Thx. Posted my link Valli. Was great taking part in this challenge. Turned out tasty and crispy. Thanks for the recipe. Have linked my post. Oops I posted the wrong link. Could you delete the first one. I have linked properly to the second one. Thanks. Turned out good. The first day it wasn't very spicy but strangely, from the second day onwards the spice level was just perfect!